at all levels of Government (National, Regional, County and District). 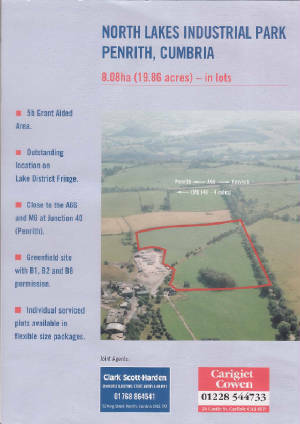 The 2001 brochure for the site has an aerial photograph clearly showing the Penrith to Keswick Railway trackbed running diagonally across the site from bottom left (North East) to top right (South West). The Design Brief given to Eden District Council in 2000 included a planting scheme. 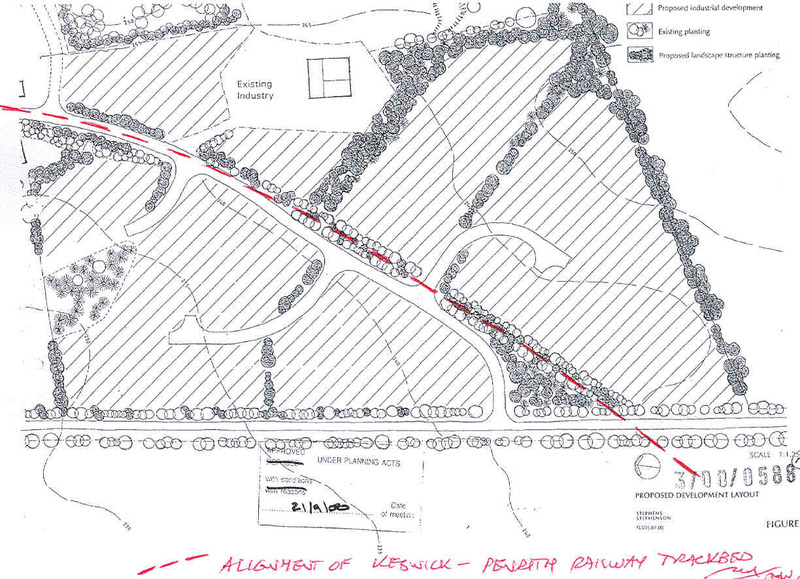 The layout proposed for the site also respected the alignment of the Penrith to Keswick Railway trackbed (shown by a red dotted line added here for clarity). The Outline Planning permission for the site granted by Eden District Council included a condition that "Any application for approval of reserved matters shall accord with the principles of the Design Brief submitted as part of this application. REASONS: To ensure a satisfactory standard of comprehensive development.". Eden District Council also has policies to protect hedgerows in general, and trees on construction sites in particular. The Industrial Park site has been almost completely stripped of vegetation and re-levelled, even where plans for new developments have not yet been published. Problems for the Railway Trackbed began when applications were lodged for internal access roads on the site. The first application was for all the roads shown on the drawing above. CKP Railways plc objected to the proposal as it would damage the trackbed. The developer cut the application back to the section shown as "Phase 1" above, which received planning permission. In 2003, the developer submitted a further application for the "Phase 2" roads above. Eden District Council received approximately 170 objections to this application - because of the damage it would do to the Railway trackbed and hence the Railway reopening. When CKP Railways plc submitted an objection, Eden District Council's Officers set about trying to assess the viability of the Railway project. Much information was provided by CKP Railways plc in response to their questions. Officers were reminded of all the Planning Policies which existed to protect the Railway trackbed, and suggestions were made about re-arranging the roads - which the developer rejected. There were only 4 recorded representations in favour of the scheme. Eden District Council's Planning Committee granted planning permission for the access roads on a majority vote of 8 - 4 in September 2004. Reference was made in the Planning Committee to a report which was commissioned by Eden District Council from TPi consultants to assess the likelihood of the Keswick to Penrith Railway reopening. That report stated that the Railway Project enjoyed considerable public support and was proceeding faster than many publicly funded projects. A Planning Officer mentioned this report and stated that the conclusion was that the Railway was "unlikely to happen". CKP Railways plc objected to the Local Government Ombudsman about the handling of this matter. The Ombudsman's conclusion was that there was a "difference of opinion" between the Council and CKP Railways plc, not maladministration. 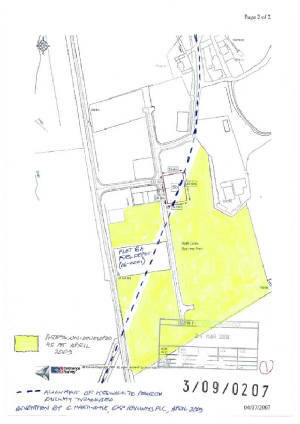 The site plan submitted with an application for an entrance sign appears to show that the area approved for development does NOT include the Railway Trackbed. A number of individual developments then followed, on different plots at the north end of the site. Most of these were warehouses, plus extensions to the storage yard for the adjacent concrete works. CKP Railways plc commented on any that were close to, or proposed use of, the trackbed. 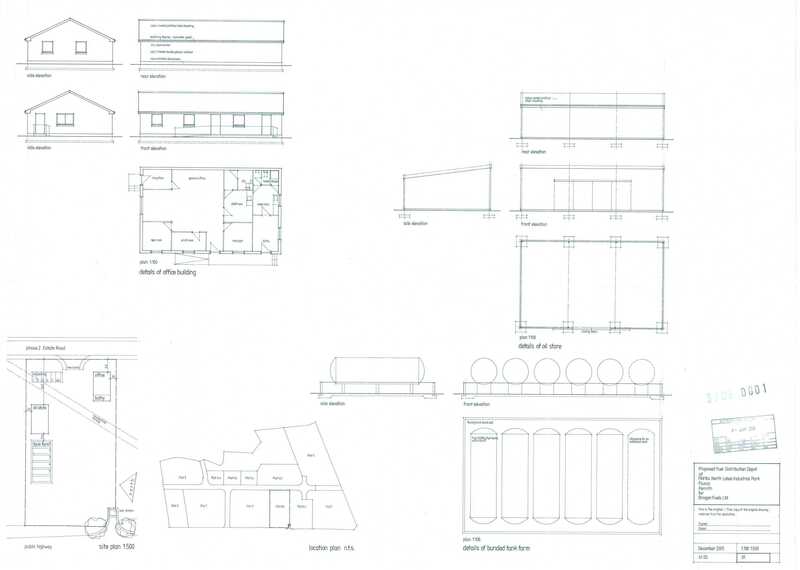 Comments on one warehouse development led to a more detailed design which did not infringe the trackbed. The next problem arose with a proposal for a fuel depot in 2006. 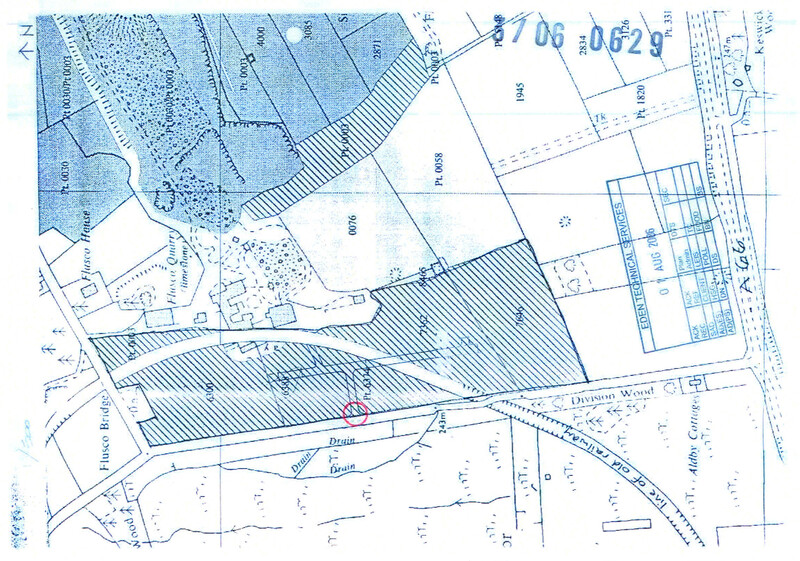 The drawings clearly showed that the Fuel Depot site straddled the Railway Trackbed. CKP Railways plc objected, quoted all the relevant Planning Policies to protect the trackbed, and remarked that there were other vacant plots available on the Industrial Park which would not affect the trackbed. Eden's own policies state that by "careful design" Railway trackbeds can be safeguarded. The Northwest Regional Development Agency (NWDA) advised Eden District Council that it supported the Keswick to Penrith Railway reopening in principle, and that the route should be protected in the Local Plan. Eden District Council repeated its previous conclusions that the Railway was unlikely to happen, and granted planning permission. The Council suggested that the Railway was not obstructed because the buildings were not located on the alignment of the trackbed. In April 2009 Eden District Council received an application (No. 09/0207) for another industrial unit in the centre of the site, right on the Railway alignment. That application was published by the Council just before Easter with only a very short time to respond. After representations from CKP Railways plc, the Council extended the time for consultation. The Council received about 60 objections about the potential obstruction to the Railway reinstatement. The Northwest Regional Development Agency (NWDA) also wrote to the Council pointing out some of the environmental and economic benefits which the Railway would bring to the area and stating that it would be preferable if the Railway alignment was protected. Brian Simpson, one of the North West MEPs, also wrote to the Council in support of the Railway Project, and asked that the trackbed be protected in accordance with the various policies at local, regional and national level, commenting that the Railway Project has “real significance regionally”. Despite all of these representations, the Council gave permission with no conditions whatsoever relating to the Railway. Officers in their report noted that there is a policy to protect railway trackbeds, but also seemed to imply that there was no other possible location for the industrial unit. That was not the case as to date only about half of the industrial park site has been developed. Read the "Planning Policies" page to find out why this struggle should not be necessary !